1. This book is AWESOME. I know we can all hop on Pinterest and pull up any and every craft project imaginable these days. But for when you need some quick inspiration without scrolling through your phone or computer all day, this is it! Not to mention, you will absolutely enjoy snuggling up on the couch with your tiny love to look through this beautiful book together. Bright and colorful illustrations make it easy for kids to pick out which activity they would like to try. And honestly, this book is a gift for parents because WINTER IS COMING (or it’s already here depending on where you live!) and we could all use more ideas for what to do with our kids on those cold snowy days. 2. Meet the INSTANT FRAME (your new best friend). If you follow me on Instagram, you know that I’m a big fan of framing your child’s artwork. It lets them know that you value their hard work and creativity. It also fosters pride in having completed a project and will encourage your child to continue developing their artistic skills. As a parent, however, I know that kids can create A LOT of artwork and it can be hard to keep up! This frame has open slots along the side so that paper can be slipped in and out with ease. It also comes in a ton of different configurations guaranteeing that one (or more) will fit in your space. 3. Invest in a Quality Art Easel. I held off on this purchase for WAY too long and I am Mrs. Art Project. The truth is we live in an apartment and I was worried about an easel taking up too much precious space. Why can’t kids just work at a table? Well, they absolutely can, but there are SO MANY DEVELOPMENTAL BENEFITS to be gained from working in the standing position. When children work at an easel, they are building shoulder, arm, and wrist strength. They also actively engage core muscles to maintain posture (no leaning or slumping in a chair for instance). And you know why all those strong muscles are important? They are crucial for handwriting success in school! So consider this a wise (and super fun!) investment in their education. 4. Become an author and write your own STORY. Anyone else out there have a child who LOVES to tell stories? My son is four and his favorite thing in the world right now is thinking up new stories to share. He also loves being told stories, often putting me on the spot to come up with original and exciting material that will live up to his exacting 4 year old standards. Enter this wonderful little book filled with TONS of ideas for interesting plots, exotic locations, engaging characters, thought-provoking vocabulary, and useful tips. Basically, everything you need to introduce Creative Writing 101 to your kiddo. 5. Because you can never have too much PAINT. I love this paint for two main reasons. First, it really is washable. As I said before, we live in an apartment, so there is no separate craft or play space in our home. We paint in the dining room so washability is a MUST (and because what fun is art anyway if you have to worry about getting messy?). Secondly, the Crayola Glitter Colors are divine. I love their pearlescent soft shimmer which makes hanging art projects all over the house a no-brainer. 6. Add FUN and INSPIRING wall decor. These handmade wooden “P-L-A-Y” letters are embellished with 100% wool felt balls (and have sawtooth hangers on the back for easy mounting). Bright and colorful, these custom letters are the perfect addition to any child’s room or creative corner in your home. As Albert Einstein said, “Play is the highest form or research.” So let’s encourage it! Get it from J&J Design Group HERE. 7. Relish the magic of CHILDHOOD. Author and illustrator, Antoinette Porter, beautifully captures the wonder that is a child’s mind in her book Not a Box (and its equally fantastic companion, Not a Stick). If these are currently not in your library, may I suggest adding both? These books are perfect for children under the age of 5, yet the central theme (that simple objects like a box or a stick can be anything with a little imagination) will resonate with kids (and adults) of ALL ages. 8. Take your ART SKILLS to the next level. In search of the perfect gift for the older art-loving child in your life? Look no further! Let’s Make Some Great Art is filled with TONS of art activities and creative prompts to unleash your imagination. It also introduces some of The GREATS (i.e. Leonardo Da Vinci, Pablo Picasso, Jackson Pollock, etc.) and their different mark-making techniques. Best of all? The information is broken down into simple, engaging, and easy to follow steps. Think of Let’s Make Some Great Art as a fantastic sketchbook because the author encourages you to draw, stamp, paint, and doodle directly on its pages. Just add colored pencils and you are all set! 9. Decorate with GLITTER (because everything is better with GLITTER). I had to take a photograph of my own set of these glitter shakers because the image provided on-line was terrible and did them no justice. Basically I love this set because of the colors: beautiful and bright jewel-tones that really pop in kids artwork. A favorite activity in this house? I squeeze out an abstract glue design (using liquid glue rather than a glue stick) and then let my 4 year old sprinkle on any glitter he chooses. This makes the most GORGEOUS, FOOLPROOF, and FRAME WORTHY abstract art design you can imagine. Mom Tip: do the project in a box for easy clean-up of excess glitter. Get it from Michaels Kids HERE. 10. THINK BIG (because imagination needs space to explore, grow, and learn). If you took fine art classes in college, you are probably familiar with the Strathmore brand. If not, let me introduce you to some seriously good quality art paper. Why am I including such excellent paper on a children’s gift list? Let me explain. 1) I am usually thinking about art projects for display in my own home. This paper is acid free which is crucial for protecting your treasured keepsakes. 2) I love the large size (18×24 in.) which allows kids to dream big. No one wants to run out of space when drawing an intergalactic universe, an endless jungle, or a soaring mountain range. This is definitely the paper you will want to pull out when designing the illustrations for your original adventure story (see no. 4) or working at your easel to create a masterpiece for Grandma (see no. 3) or practicing newly learned mark-making techniques on a much bigger scale (see no. 8). Get Strathmore 300 Series Sketch Pad from Michaels HERE. Get Strathmore 400 Series Watercolor Pad from Michaels HERE. Happy Gift Giving! What are some of YOUR favorite art products for kids? Let me know in the comments below! Not sure what to do with an empty wall in your home? 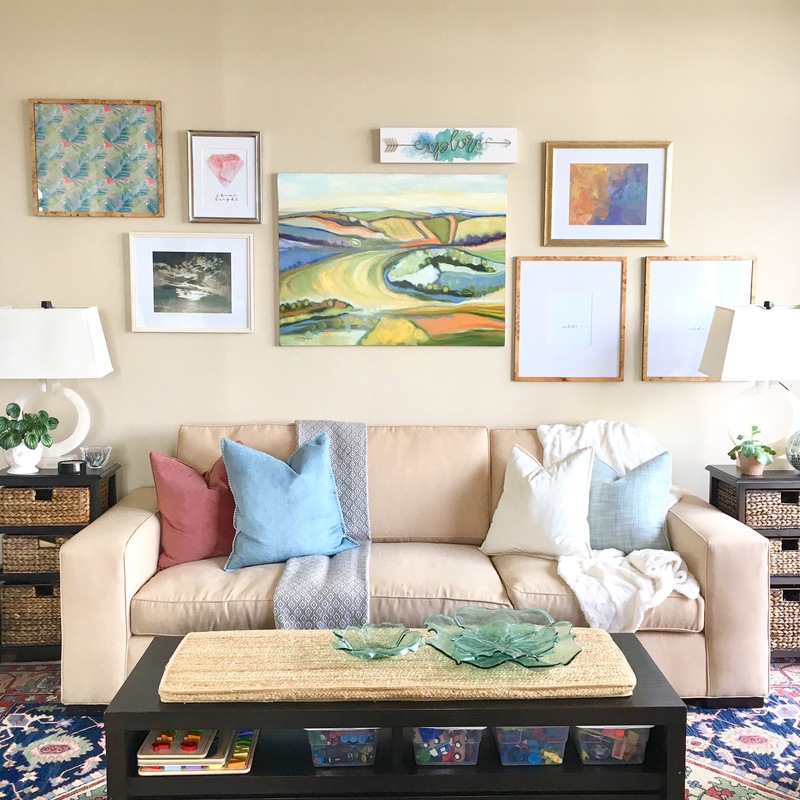 Sign up to learn more about fantastic artists, wall design tips and tricks, and art happenings in the DMV - all delivered right to your inbox. This is Art Consulting for the Real World! I am passionate about art and design and believe there are art solutions for every budget. Let's create a stellar space in your home today! Some exciting news! I am now a contributor to the DC Area Moms Blog! Click HERE to check out this amazing website. © Copyright Lauren Heller Art Consultant by LyraThemes.com. All rights reserved.